This week I am at a conference in Las Vegas, where many of the lectures that I will be giving and listening to will be about “Patient Satisfaction” or “Customer Service.” I thought it would be appropriate that my posts be about this topic. 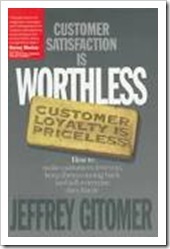 Jeffrey Gitomer also has written a book called “Customer Satisfaction is Worthless, Customer Loyalty is Priceless.” I know that when I mention a book, I always say that it is a good one for your library but…this one is a definite must if you are in any type of customer service business. I will cover one principle tip that Jeffrey shares in his book each day this week. Address how we can apply it to our job and make our business one that creates loyalty with those we serve. Your customer is your paycheck. Do not be fooled by the signature at the bottom of your payroll check. The guy who signed the check didn’t put the money there, your customer’s did. No customers, no money. You should change your customer greeting to “Hi, thanks for the food!” Your business is worthless, and your wallet is empty without funds provided by customers. 1. How do you think of your customers? 2. Do you recognize that they feed your family? Do you understand that your degree of service and help determine your wage and your success? Many times employees think that their paycheck will always be there whether there is an abundance of customers or few. It is the effort of those who serve the company’s customers that make the doors open each day or close for good. What can you do today to create more loyal customers for your company? This entry was posted on Monday, November 30th, 2015 at 8:00 am by Tina Del Buono, PMAC. Filed under Business Improvement, Customer Service, Educational Tips, Manager Topics, Medical Practice Management. You can follow any responses to this entry through the RSS 2.0 feed. Both comments and pings are currently closed.